Is it already a painting time of year? Every once in a while, every house owner encounters a tough painting task. As if searching for proper interior paint isn’t a difficult task already, you also have to choose a perfect exterior paint. The things get even more complicated when you realize that your garage door requires special treatment because of its materials (usually galvanized metal and wood). Garage doors are exposed to many treats such as rain, snow, sun, wind, and others, which cause frequent paint flaking and fading. If you want to prevent this and prolong the life of your garage door, you’ll need to find a quality paint! Not to mention that you probably want to find a unique color to freshen up the entire house, right? There are many exterior paints on the market, but not all of them are suitable for your garage door. If you want to prevent peeling of your door’s paint, you’ll need a quality paint that can withstand harsh weather conditions. Searching for the best garage paint is a demanding task that requires a lot of your time, especially considering the process of choosing the right color. Therefore, we made a list of 10 best garage door paints that will hopefully help you find the perfect one for your needs! 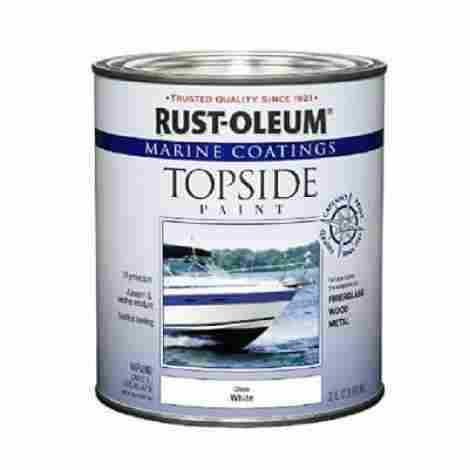 Rust-Oleum is a well-known manufacturer that produces top-notch paint. This is one of the most popular Rust-Oleum paints. Even if it’s primarily designed for boat painting, people use it for various purposes such as painting walls, doors, pieces of furniture, and other similar stuff. We find it very useful for garage door painting due to its high quality and excellent resistance against harsh weather conditions. This high-quality paint has a base of oil which makes it easier to handle and gives finesse. You’ll also be able to brush easier and to paint more accurately with excellent leveling. Lastly, the paint needs around 1 or 2 hours to dry, which is quite impressive. The only thing that most users dislike about this paint are extreme fumes. While this is not so bothersome when painting a garage door, it can be very harmful during indoor use, so make sure your working space is well ventilated. As we already said, Rust-Oleum resists abrasion and extreme weather conditions, including harmful UV rays. This way, the paint will last for a long time, relieving you from exhausting frequent painting processes. The paint is ideal for fiberglass, wood, metal, or any other surfaces. Our favorite color is a navy blue, but there are 10 different colors from which you can choose the perfect one for yourself. You can also choose a 0.25 or a 1-gallon bucket according to your personal needs. Rust-Oleum is a long lasting paint that we sincerely recommend for your garage door. You’ll most likely use it to paint other stuff around your house as well. Lastly, it comes with an attractive price that will make you love it! Por-15 offers high-quality paint for metal surfaces. If you want to freshen up your garage door made of metal, this would be a wise pick! Apply it over your regular paint for a perfect finish, and the door will be fully protected for a long time. Keep reading if you want to find more about this excellent product! 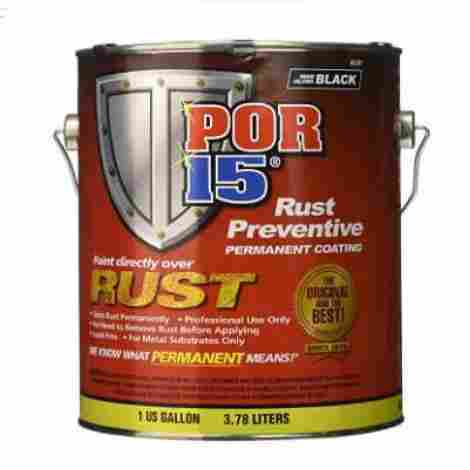 POR-15 is a rust preventing coating that ensures a perfect finesse of your regular paint. With an additional layer, your paint is protected from cracks and peels, and it will last for a long time! You can use this paint as a primer that goes underneath your regular paint, or you can apply it directly to the rusty surface (no, you don’t have to remove the rust before using it). Either way, it will prevent the peeling of the paint. However, keep in mind that this paint doesn’t perform well when exposed to the harmful UV. This exterior paint has a lead-free formula which makes it safe for indoor painting as well. You won’t have to ventilate the entire working area because of the harmful fumes. It’s also perfect for leveling and it gives an amateur painting a professional finish. You can pick a clear coat, a gray coat, a black coat, or a silver coat, according to your personal preference. There are also several different paint bucket sizes that allow you to get just as much as you need, avoiding the waste of paint and your money. Finally, the paint will dry fast, leaving a painted object in perfect condition. While this rust preventive coating offers incredible value, it might be too expensive for some people. Those who have some extra money should definitely try it out, but those who are on a limited budget might want to search for other options. Total Boat is a well-known manufacturer that produces quality boat paints. It’s also very popular for its line of garage door paints. Here we have a long-lasting and quality paint that you can use for many painting projects including your garage doors. The paint is made of high-quality materials, and it offers a professional finish whether you’re a professional painter or a DIY enthusiast. The paint has one component marine polyurethane ingredient that gives the paint a great finesse. It makes the paint durable and prevents cracking and flaking. Also, this formula will give all your painting tasks a professional finish without any uneven and amateur ends. However, we have found one big drawback – the paint is not entirely resistant to water. While this isn’t such a big issue with exterior painting (rain can’t cause too much damage to door paint), it can be quite inconvenient when it comes to the newly painted boat parts. The paint is available in a variety of colors, so you can pick the one that perfectly fits your aesthetic requirements. You can brush or spray it on fiberglass, wood, and many other surfaces. Not to mention that this paint gives a glossy finish that will make your garage door stand out from the entire neighborhood. Additionally, this makes a surface easy to clean and fresh looking for a long time. 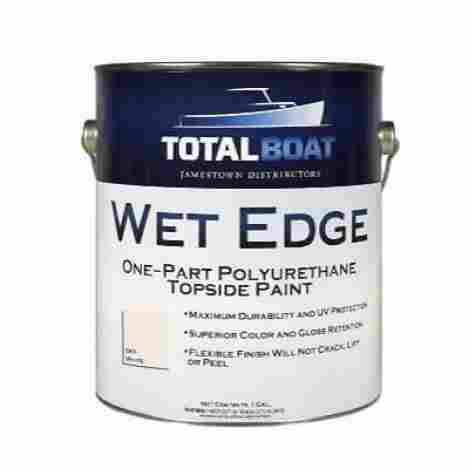 The Total Boat paint offers great value and it’s reasonably priced. It’s not one of the cheapest options on the market, and it provides durability and excellent painting results which makes it worth every penny. 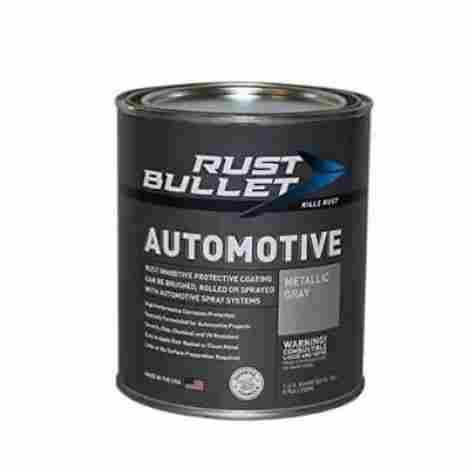 This Rust Bullet paint is mainly designed for automotive applications but you can use it for any metal surface. People all over the market are praising this rust inhibitor paint for its great features and excellent performance. Keep reading if you want to find more about it! You can use this paint as a protective coating for your garage doors, which is very useful considering that they are usually made of iron or steel, or you can use it in combination with other paints. Either way, you can apply this paint directly over various surfaces, without any need to take off the paint or rust. Overall, Rust Bullet is simple-to-apply paint which requires low maintenance. You can use it for DIY painting as well as for industrial, marine, and home applications. The paint is UV resistant which means that it won’t fade or crack easily when exposed to the harmful sun rays. It’s also scratch and chip resistant which makes it extra durable and long-lasting. You’ll especially love it because it doesn’t require tiresome preparations – almost everybody can use this paint with just a little effort. You can brush, roll, or spray it on any metal surface, and you’ll get amazing results. Lastly, we should warn you that this paint is really durable. A warning like this might seem silly, but don’t make that mistake to paint without gloves. Otherwise, you won’t be able to take it off for a couple of days. The Total Boat paint offers great value and it’s reasonably priced. While it’s not one of the cheapest options on the market, it still provides durability and excellent painting results which makes it worth every penny. If you’re looking for an affordable paint that you can use for interior and exterior applications, Rust-Oleum might be the right choice for you! It performs excellently on almost any surface, providing a professional finish whether you’re an experienced painter or a DIY enthusiast. As we already said, Rust-Oleum offers paint that is suitable for both interior and exterior surfaces such as wood, metal, aluminum, masonry, and others. This makes it an excellent option for painting garage doors! The oil-based formula provides excellent protection against persistent rust, and it makes the paint more durable. It will leave a slight smell dough, so make sure to ventilate the working space if you use it for interior painting. Pro tip: Make sure to use an appropriate brush designed for oil-based paints! The paint is weather and corrosion resistant which makes it a perfect solution for your garage doors. It also has excellent resistance to abrasion, fading, and chipping. You’ll be able to paint any surface with great accuracy and minimal imperfections. However, keep in mind that colors might turn out brighter than you expect. If you want a solid color, you’ll need to do multiple coats. We recommend using a primer, preferably gray or black, to make the color stand out more. This Rust-Oleum paint is probably one of the cheapest options on the entire market! Surprisingly, it offers excellent performance and a perfect finishing touch for money. If you’re a fan of bright colors, give it a try. You may end up pleasantly surprised with its top-notch features. 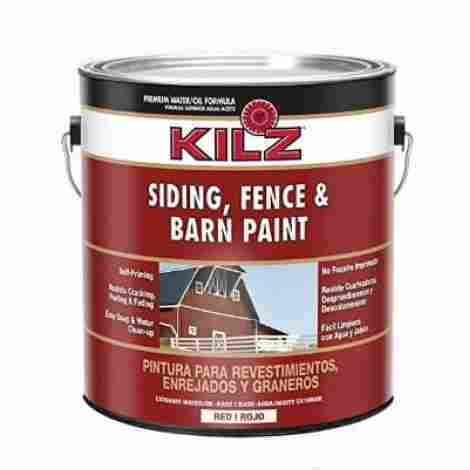 Kilz made this paint inspired by traditional and timeless rural barns. As a matter of fact, it’s primarily designed for exterior wood painting projects such as painting bars, fences, and doors. We also find it very efficient for garage door painting. Therefore, if you’re searching for a vibrant color to freshen up your garage door, Kilz would be a perfect choice! This paint is designed for exterior painting because it can endure harsh weather impacts, and it resists cracking, peeling and blistering. It also has great coverage abilities and offers a high-quality finish. The paint contains a unique water/oil base that makes it versatile and long-lasting, so you can use it on various surfaces and for many painting tasks, especially for garage doors that are exposed to many threats during a year. However, we expected for this paint to have more oil in the base considering that it’s designed for exterior painting. Without it, the paint starts to peel shortly after the application. This paint doesn’t require any preparation before the usage. You can easily brush, spray, or roll it on any surface. It comes in a white or red vibrant color that will make your garage door stand out! Additionally, you won’t have any cleaning problems with this paint. You can take it off by using water and soap. We find Kilz a bit pricey considering the lack of oil in its base. It does offer excellent value and you can use it to paint various stuff around your house, but we expect some improvements of the main formula in the future. 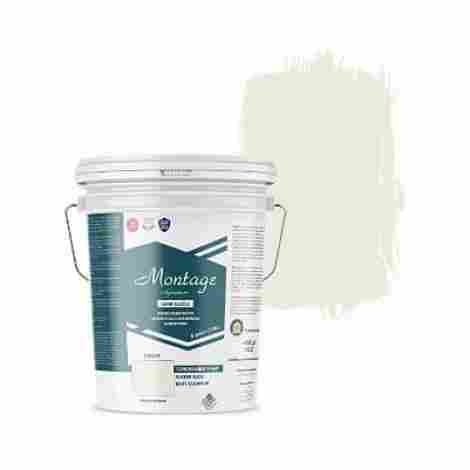 Montage Signature features a versatile paint suitable for both interior and exterior painting. You can effectively paint your house, garage, or furniture, as well as small residential spaces or large commercial buildings. Overall, it’s one of the high-quality paints that will last for a long time. The paint offers superior coverage and excellent protection. Its water-based formula lets you brush smoothly and evenly while delivering maximum coverage. Montage Signature also features improved sealing technology that provides protection against moisture, mold, and mildew. It’s a semi-gloss paint – it’s not as reflective as full glossy paints, but it’s ideal for surfaces that require frequent cleanups such as garage doors. Additionally, the manufacturer offers 24 classic shades and many limited edition colors from which you can choose your favorite natural shade. You’ll especially love this paint because of its eco-friendly formula. It offers high-quality materials that are environmentally safe and pollutant-free. Montage uses recycled paint that comes from raw and post-consumer latex paints. Overall, this top-notch paint offers excellent performance and outstanding finishes. The only drawback we have found is connected to the bucket design. Many users complained about the badly designed lid that makes the paint pour out from the can when opened. The manufacturer should definitely resolve this issue in the future! Montage Signature is definitely expensive paint, but it comes with a 10-year warranty. This way, you don’t need to worry about wasted expensive paint. While people who are on a limited budget will definitely skip this paint, those who have some extra money will find it very useful and valuable. Here we have another high-quality paint from Rust-Oleum that you can use for both indoor and outdoor painting projects. Rust-Oleum provides a metallic finish with a fresh new appearance which makes it ideal for those who want to achieve a modern look with their garage doors. As we already said, you can use Rust-Oleum to paint interior and exterior surfaces such as wood, metal, plaster, masonry or unglazed ceramic. It offers an oil-based acrylic formula that resists chips and prevents flaking. You’ll especially like that this paint needs only 30 minutes to dry completely. However, don’t forget that oil-based paint can cause you a horrible headache if you paint in a small, closed area due to the strong smell. Painting with Rust-Oleum paint is quite easy. You'll be able to apply the paint smoothly on the surface and admire the glossy professional finish. With Rust-Oleum, there are no uneven parts or brush marks. However, you’ll need to paint quickly because this paint really dries fast! Overall, the paint offers an outstanding finish whether you’re a professional or a DIY enthusiast. You will probably struggle a bit with a repeated coating (requires at least two coats) because the paint is very thin but other than that you won’t have any major issues. 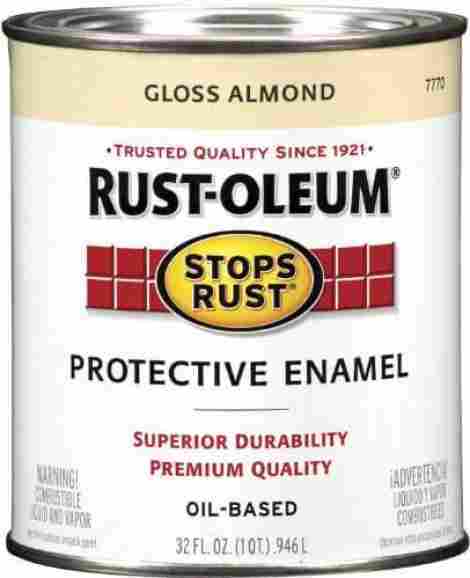 Along with excellent performance, Rust-Oleum comes at a reasonable price! It might take you some more time to paint a wider surface, but it's worth the effort considering the flawless result. Also, we can’t complain too much about the all-purpose paint that has a budget-friendly price. This is an all-purpose paint suitable for both interior and exterior painting. You can use it for industrial applications, machinery, commercial uses, or to paint various stuff around your house. It gives an excellent finish to your painting tasks regardless of the type of the surface, and it provides protection against harsh weather and other harmful threats. All of this makes it a perfect choice for garage door painting! The paint is an excellent choice for painting wood, concrete, plaster, masonry, hardboard, and metal. Therefore, you’ll probably use it for many around-the-house painting tasks when you finish painting your garage door. It will give your painted object a professional finish and provide a tough, durable surface that can resist scuffs, fading, cracking, and peeling. The only thing that users find as a drawback is a fact that this paint requires a lot of time to dry. It could be pretty annoying when you’re painting on the outside because you have to guard the fresh paint against strayed birds or animals until it dries. 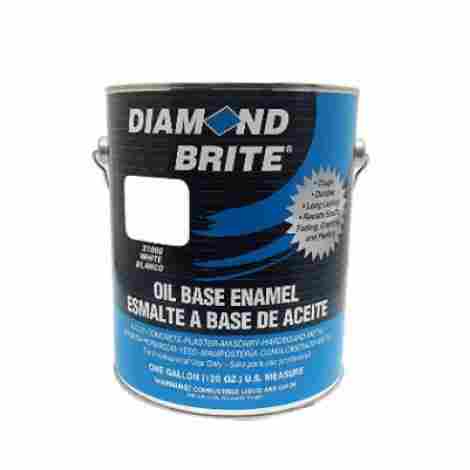 Diamond Brite Paint is really easy to use – brush, roll, or spray on the paint on the surface without any previously performed preparations. It gives all your painted objects a fresh appearance and protects them from mold and mildew. It’s also abrasion and rust resistant, so it will probably last for many years. Additionally, you can choose the perfect paint for yourself from 12 available colors as well as you can decide for the proper bucket size. However, it seems that the package isn’t well protected – apparently, there’s no protection between the box and the paint bucket, thus the bucket sometimes gets damaged during shipping. The paint offers excellent performance, it looks really nice and comes at a reasonable price. Overall, you’ll be fully satisfied with the purchase, especially considering that you have an option to choose a perfect bucket size. That way, you won’t waste the paint nor your money. We had to include another Rust-Oleum paint on our list because of its excellent quality and great coverage abilities. This one is a basic white paint that will give your garage door fresh and modern appearance. You can use it to paint many different surfaces such as wood, metal, and plaster, and achieve flawless painting results every time! This is a basic white paint ideal for those who want to freshen up their interior or exterior walls, or house and garage doors. The paint applies easily and it offers outstanding coverage. It does require at least 2 coats if you want perfect protection against flaking, cracking, and fading. An additional coating will also provide a flawless finish. This will take some extra time, but other than that you won't have any big issues with the painting process. The paint provides excellent protection against mold and mildew, and it resists dirt and moisture on film coating. You also won’t have any problems with cleaning it from your skin. Soap, water, and some light rubbing will do. However, keep in mind that this paint is primarily designed to protect the surface from mold and mildew, and it could be damaged by harsh weather conditions. If you need a thicker paint, you should search for another option. 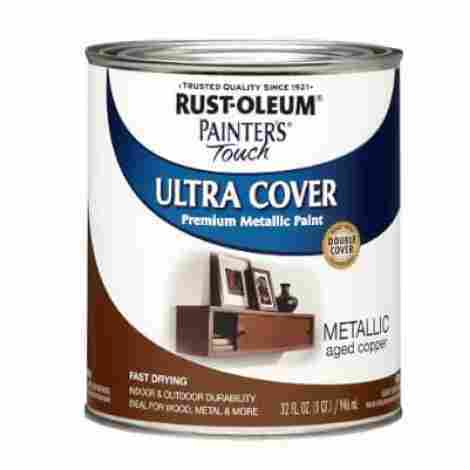 Rust-Oleum continues to produce quality paints that come with an attractive price. You can get this excellent paint for a reasonable amount of money, and paint to your heart's content! The first thing that we looked for in every paint is the high-quality formula that ensures an even finish. The paint’s formula influences the finishing results, and it gives protection against peeling, cracking and fading. It’s very important to know that the paint will last for many years regardless of the outside threats. Durability is crucial when it comes to garage door paints because they have to withstand harsh weather conditions during the entire year. Therefore, paints that have first-class formulas are on the top of our list. We ranked our 10 best picks according to their versatility and user-friendly characteristics. The surface of garage doors is easy to paint, but it’s always good to have more applying options. People often end up using the same paint for various painting tasks, so searching for a versatile paint is a reasonable thing to do. Also, it’s important to know whether you can use the same paint for various types of surfaces. The ones that perform perfectly on many surfaces all together are ranked higher on our list. Paints often come with harmful and irritating fumes. The best thing you can do is to purchase an eco-friendly paint. However, only a few brands offer these paints so you’ll most likely end up using regular paint with a lot of fumes. The good thing is that painting a garage door is taking place outside, so you won’t be too much exposed to the harmful smell. However, we had to take this into account while evaluating the best garage door paints. After all, the ones that release harmful fumes require more ventilation and protection that takes a lot of your precious time. We made an effort to examine all possible features of every garage door paint on our list in order to rank them according to their overall quality and performance. The balance between the cost and value of every product was equally important. Whether you’re going for an expensive all-purpose paint or a budget-friendly one, you want a quality product that will fulfill your painting requirements. Therefore, we ranked the paints according to the provided value for money. Last but not least, we wanted to be sure that you’re getting a well-preserved bucket of paint. Some manufacturers fail in providing this, sending a product without protection which results in damaged cans. The damage is sometimes negligible, but in some cases it causes paint pouring out and that wastes your money. Therefore, the best-packed paints collected more additional points and ended up on the top of our list. You have probably found a perfect paint for your garage door, but we advise you to take a few additional moments to think it through. There are some factors that you should consider before you make a final decision and purchase the paint. What kind of finish do you want to achieve? Some people like to have a glossy finish because it makes the surface look fresh and new for a long time. On the other hand, you’re maybe one of those people who prefer a classy look and want a matte finish. Think about that before you purchase the paint. Also, make sure to pick the proper color for your garage door – it should contrast the house color and compliment the whole area. Which size of paint bucket do you really need? Don’t make that mistake and buy a big bucket that will eventually go bad and waste your money. Besides, you can go for a medium-sized bucket and a small one, and then leave the small one unpacked for latter projects if you don’t need it right away. If you want perfect painting results, you’ll need a primer and a top coat. While the primer helps you set the paint on the surface properly, the top coat ensures a perfect finish that will last for a long time. Some paints come with both of these things, while some budget-friendly paints require an additional purchase. In the end, it all comes down to your personal preference and budget limitations. Which type of paint do you need? Do you need a paint that will resist harsh weather conditions, or you need the one that provides outstanding protection against mold and mildew? The choice seems simple when you’re buying a garage door paint, but if you want to use it for painting other things as well, you’ll want a higher level of protection. Think about everything you need from paint and only then make your move and purchase the paint. Q: Why should I paint my garage doors? A: There are a couple of reasons why painting your garage doors is a good thing. For example, if they are not particularly attractive or updated, you’ll want to paint them out according to the trim color, so they don’t draw too much attention. On the other hand, if you already have several colors on your house, you’ll want to paint your garage doors in the same color as the exterior walls. In case you have nice garage doors, and you want to show them to the entire neighborhood, dark colors would be a wise option. Just make sure that the color matches the entire house color scheme. Lastly, don’t be afraid to experiment! You can use vivid colors or match two colors on a door as well, as long as you follow a color combination of the entire area. Q: How often do I need to paint my garage doors? A: Well, the durability of the paint depends on its overall quality. 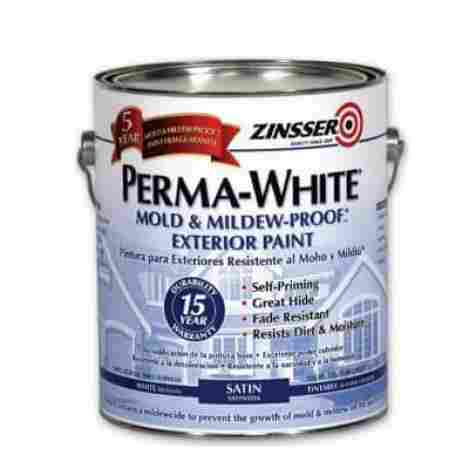 Newly designed paints provide excellent protection against mold, mildew, UV rays, cracking, and peeling for many years. The average paint will endure around 3 years before it fades out, but you can repaint the object earlier if you want to freshen it up a little. We recommend avoiding the cheapest paints for your garage doors. They need special attention due to extended exposure to harsh weather and other outside threats. Q: Can I use garage door paint for other painting projects? A: Of course you can! It would be rather odd and very expensive to buy a big paint bucket just for one garage door. These days, there are many multipurpose paints that you can use on almost any surface such as wood, aluminum, plaster, masonry, hardboard, and many others. Pick the combination that works the best for you! Also, keep in mind that buying a big paint bucket isn’t always a smart choice. To avoid wasting money on new paints, you can go for several smaller buckets that you can use one by one according to your needs. Q: How should I prepare the garage door before painting? A: You should definitely clean them before you start applying the paint. The surface should be sparkling clean if you want a perfect finish without any uneven parts. However, some thick paints don’t require scraping off the rust or the layer of old paint, and they still give exceptional finishes and fresh look. If you purchase this type of paint, you can apply it directly to the surface although we recommend taking off the most visible imperfections. Lastly, you’ll have to apply a primer before you start painting. It adds to the paint’s durability and provides a flawless finish.